Working Capital Conversations looks at The Sharing Economy – businesses like Uber or Lyft or AirBNB rewriting traditional business models so that people like you and me can compete with major corporations. Thinking to stay at the Hilton on your next Paris vacation? Why not rent a room – or a condo – from a local Parisien, getting more space at a lower cost. Tired of waiting for a taxi during New York rush hour? Hire a private car, and get alerts telling you once it’s arrived. But just as the Sharing Economy is changing personal economics, it also impacts big business, with tens if not hundreds of billions of dollars in investments and transactions. The newcomers gain billions in valuation and revenue. Major brands create sub-brands to compete. So what’s it really like inside the Sharing Economy? What does it mean to be a buyer or a seller? Is this a passing fad – the selfie of global business? Joel Stein wanted to find out. Stein, of course, is a writer, reporter and humorist at Time Magazine. 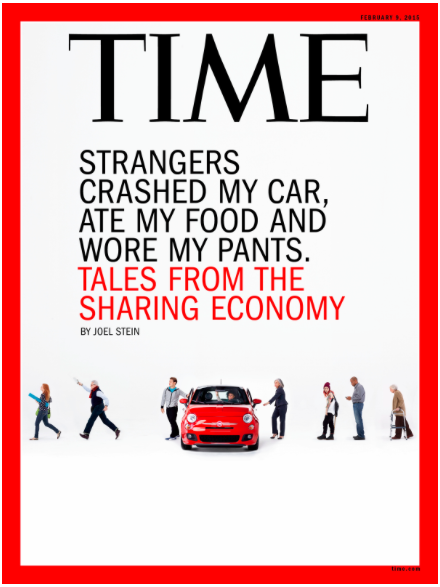 His cover story – “Baby, You Can Drive My Car, and Do My Errands, and Rent My Stuff…” – explores the Sharing Economy and provides answers with the mix of insight and absurdity that Stein has delivered for years.